Mozilla has united the release schedule of Firefox for desktop and mobile. Yesterday's release of Firefox 23 for desktop systems was accompanied by the release of Firefox 23 for Android. Existing users should have received the update to version 23 by now, while new users can download it from the official Google Play website. The new version of Firefox for Android ships with several interesting new features that most mobile users will find useful. A long awaited change is the ability to change the search provider that you are using in Firefox. This is set to Google Search by default, but if you prefer to use a different provider, you had to enter the address of the search engine manually in the browser's address bar until now to do so (or quick access it via bookmarks or top sites). Tap on the menu button of your phone or tablet. Select Tools > Add-ons from the context menu. Here you find several search engines now that you can enable or disable. You will probably be disappointed by the initial selection, as you find Google, Wikipedia, Twitter and Amazon listed here but no other search engine. To add others, you need to head over to the Mycroft Project website to do so. 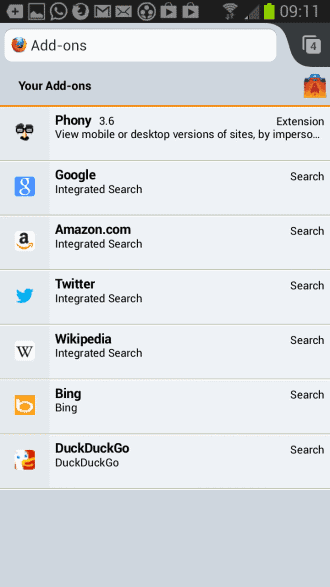 Simply use the search to find the search engine that you want to add and tap on it to display the installation dialog. Once done, it becomes available as a search provider in the Tools > Add-ons menu. You can long-tap search engines here to change the default search engine, and to disable or enable them. If you are reading RSS feeds on your mobile device, you may find the following feature useful. You can long-tap on the address bar of a website to display a context menu with options to copy, share, or add it to the home screen of the browser. A new feature in Firefox 23 is the ability to subscribe to the page if it has an RSS feed. Just hit the subscribe to page option in the menu, and select one of the available feeds afterwards that have been discovered. You then get the option to add it to iGoogle or My Yahoo. Mozilla notes that the feature is rather basic right now, and it shows in the selection of default providers. Google's iGoogle for instance will be shut down on November 1, 2013. Firefox displays the page title by default in the address bar. If you prefer to see the address (url) there instead, you can now make a change in the settings to do so. I personally prefer to have the url visible at all times as I can use it to verify that I'm on the right page, and not some phishing copy cat. Tap on the menu button of your phone. Select Settings from the context menu and scroll down until you find the title bar preference. Tap on it and switch to show page address. The address bar hides automatically once you start scrolling down. To bring it back, either scroll up again or press the menu button on your phone. Articles on web pages can be added to your reading list by long-pressing the reader mode icon in the Firefox address bar. A short tap opens the current article in reader mode right away. Here you also find the new Serif / Sans Serif font toggle. Firefox Health Report is now implemented (preliminary) in Firefox for Android. 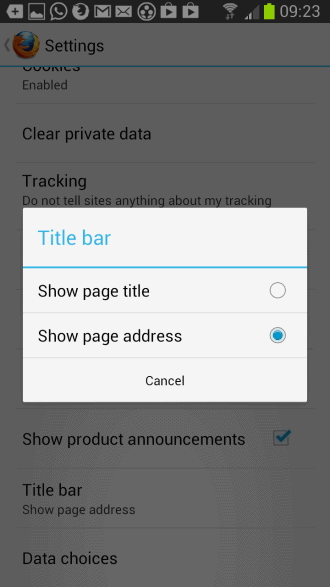 You can disable the feature with a tap on the menu button, and the selection of Settings > Data Choices. The Awesome Screen, that is the screen that opens up when you start to type in the address bar, supports a switch to tab feature now. It displays open tabs in the results that you can switch to immediately. It remembers search terms as well now. You can access the full Firefox 23 for mobile release notes here. Are you using Firefox on your mobile device? Why can’t user just input the URL of the search provider they want (in Settings) like they can in Firefox-Desktop? Why so much limitation in the mobile versions? title and url are both critical pieces of information! how do i show *both* at the same time?